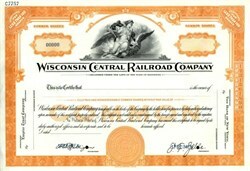 Beautifully engraved specimen certificate from the Wisconsin Central Railroad Company . This historic document was printed by the American Banknote Company and has an ornate border around it with a vignette of an allegorical woman with wings. This item has the printed signatures of the Company's officers. The original Wisconsin Central Railroad Company was established by an act of the Wisconsin State Legislature and incorporated in February 1871. It built track throughout Wisconsin, connecting to neighboring states, before being leased to Northern Pacific Railway between 1889�1893. It became the Wisconsin Central Railway Company in 1897, and back to Wisconsin Central Railroad Company in 1954. The railroad was merged into the Soo Line Railroad in 1961.